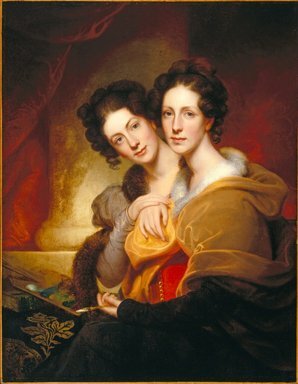 Inscribed verso: "Rosalba Peale and her sister Eleanor Jacobs, painted by Rembrandt Peale, N. York, 1826. The property of their mother Eleanor Peale." Curatorial Remarks: In this glowing image of two of his nine children, Rembrandt Peale paid equal tribute to their sisterly love and to their own embrace of artistic pursuits. Pressed against each other, with arms delicately linked, Rosalba Peale and Eleanor Peale Jacobs sit before a tapestry-covered table on which a palette and volume of music rest. The talented Rosalba, a constant aid in her father’s work, holds a drawing tool in her hand.